By Melissa Lennig on May 6, 2017 Leave a Comment. This content contains affiliate links. As an Amazon Associate I earn from qualifying purchases. Want to make this summer one they will never forget? 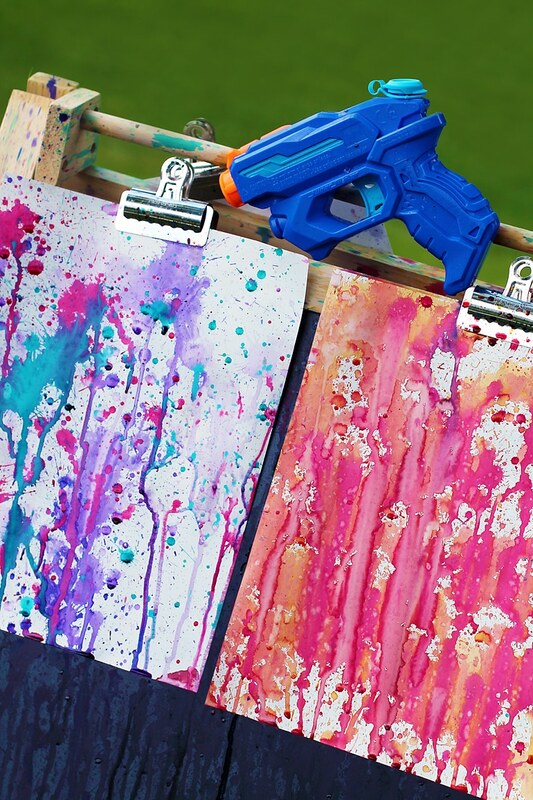 Turn on the sprinkler, pass the kids a couple cans of shaving cream, then prepare for the most epic, most messy, and most memorable day yet. 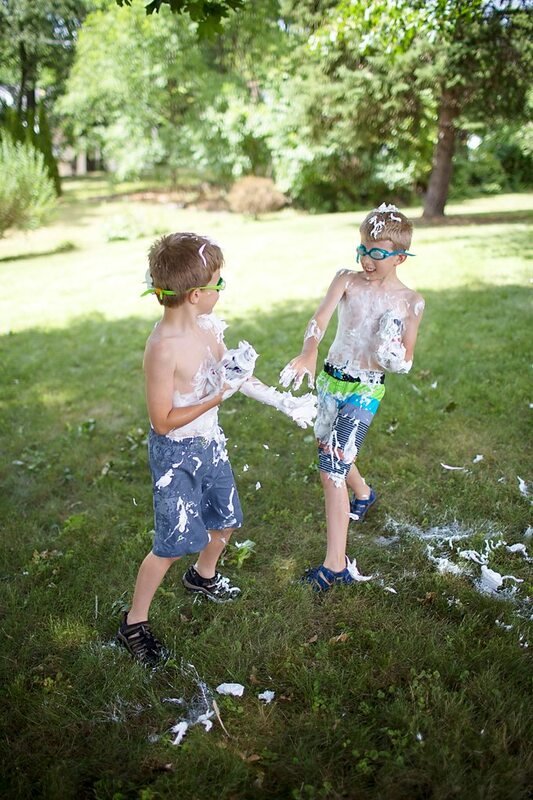 Enjoying a Shaving Cream Battle is the perfect way to connect as a family, share laughter, and enjoy a beautiful summer day. It was 1994. My cabin-mates and I were enjoying a walk around summer camp with our camp counselor when all of a sudden, another cabin jumped out from behind the trees. “Get them!” their counselor yelled as she pulled a pink can of shaving cream out from behind her back. Before we knew it, we were being attacked on all sides! Of course, the entire shaving cream battle was arranged between the two counselors…it was our evening activity that night! And what wild fun it was—a memory I will never forget! This guy! I think he’s planning his revenge…watch out Little Brother! 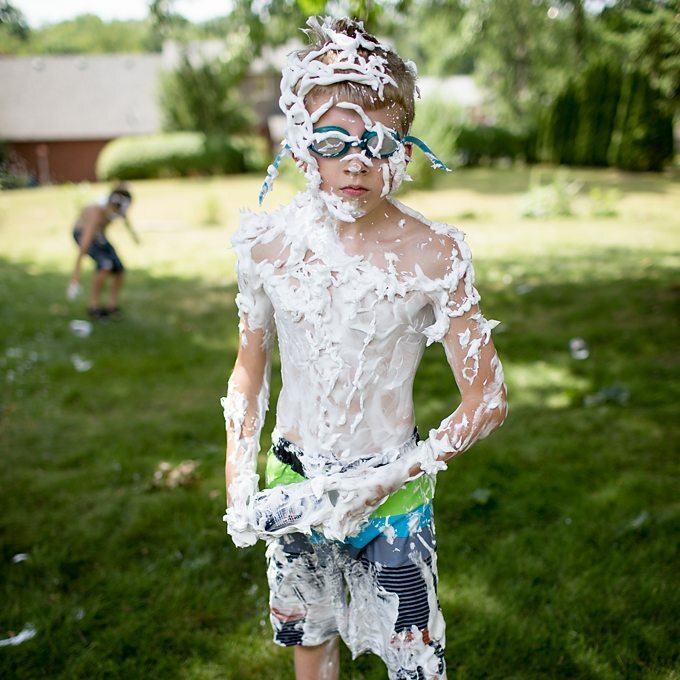 The swimming goggles did an excellent job of keeping the shaving cream out of the kids’ eyes. 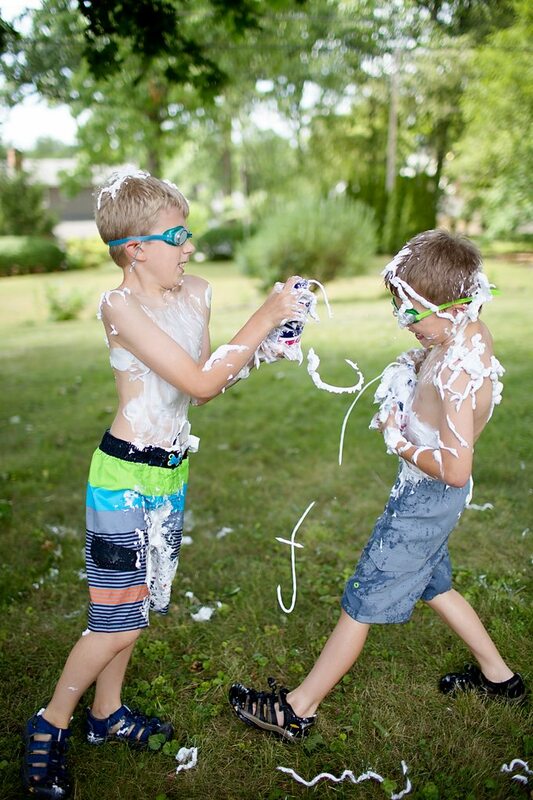 My boys soon discovered that when their goggles became covered in shaving cream, a quick run through the sprinkler would clean them off. When the battle is over, cleanup is easy. Wash away shaving cream on the ground with the hose. Don’t let the summer fun stop there! Click the images for more fun summer activities for kids.